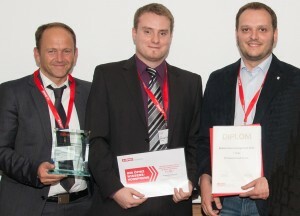 In June 2013, the ÖPWZ-Forum KVP & Innovation presented Fill with the “Best Idea Management 2013” award during the Idea Management & Innovation Congress. A jury of international experts evaluated the idea management processes submitted by the companies according to clearly defined criteria. Fill was thereby able to impress the jury with its system and the strategic integration of it into the company. “Fill anchors its idea management sustainably in the corporate culture. It is really filled with life,” said jury chairman Hans-Jürgen Mundt from the Idea Management Center in Frankfurt, explaining the reason for the award. Salzburg/Gurten, 1 July 2013 – Only the best of the best receive the Idea Management Awards of the ÖPWZ (Austrian Productivity and Profitability Center) Forum KVP & Innovation each year. The prize for the “Best Idea Management 2013” went this year to the Fill machine engineering company from Gurten, Upper Austria. The clear system and the strategic integration into the company turned the decision in favor of the machine and plant engineering company. “This is an acknowledgment of our work and proof that idea management and innovation are far more than catchwords at Fill; they are a daily reality. The award goes to the whole team,” announced CEO Andreas Fill happily. Modern idea management promotes the economic upswing and supports an innovative corporate climate. It serves as a strategic tool with economic potential. Fill impressed the jury with the clear objectives and the strategic integration into the company. At Fill every idea submitted is first examined by an ideas team, then categorized into “FIFA ideas” (“Fill In Form Active”), product ideas or innovation ideas, depending on the content of the idea. During the innovation process, the ideas undergo a standardized process in the form of an idea profile. They are then assessed according to the criteria degree of innovation, customer acceptance, investment/costs and lead over the market. The goals of the Fill Idea Management are included every year in the balance scorecard, analogous to other corporate goals. The degree of fulfillment is evaluated every quarter and goes into the company’s own indicator system. In this way the idea management system is sustainably anchored in the Fill corporate culture and is practiced in the daily working routine, and this was the reason given by the ÖPWZ-Forum KVP & Innovation for the award going to Fill Machine Engineering.